What is it that makes a Mai Tai so appealing? — That you drink it watching a tropical sunset over the Pacific?…or the fresh pineapple, kitschy paper parasol and mint bouquet that stud the glass? Maybe it’s that once you’ve made your way through a few Mai Tais over the course of a Hawaiian vacation, you forever associate the drink with balmy beaches, swaying palms and a total surrender to relaxation. The provenance of the drink is disputed – Don the Beachcomber claims to have invented it in 1933, but circumstantial evidence supports Vic Bergeron’s claim to have created the tiki drink for his Tahitian friends at the first Trader Vic’s in Oakland, California in 1944. In 1954 Vic adapted it for the Royal Hawaiian Hotel in Waikiki, where it became forever associated with the islands. After sampling several…okay, dozens…of Mai Tais on the Big Island recently, I returned home determined to master this distinctive tropical classic. I mixed up all the different versions I could find, from syrupy sweet to overpoweringly rummy, and ten attempts later, poured the perfect Mai Tai — clean, fresh and flavorful. Some versions of the Mai Tai contain orange juice or pineapple juice and substitute Cointreau for the Orange Curacao. This is my hands-down favorite, and high quality rum makes a big difference. Mix the first six ingredients and shake over cubed ice. Strain into a glass filled with crushed ice. 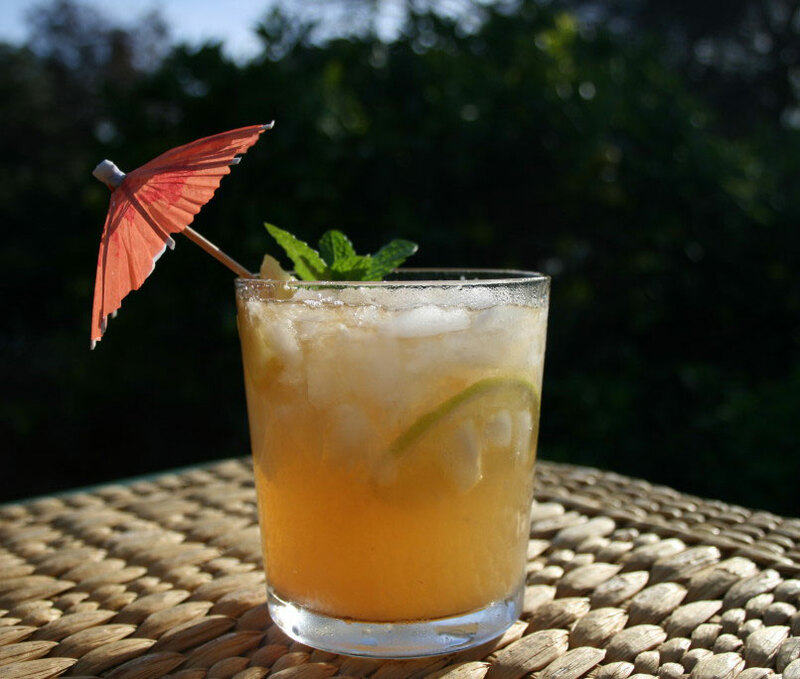 Float ½ ounce dark rum on top and garnish with a pineapple wedge and mint sprig. Don’t forget the parasol.